It's hard to imagine anything more appealing than a sparkling, white smile. Yet our teeth rarely stay as white as we'd like them to without a little help. Fortunately, that help is available at Renew Dental Arts, your specialist in cosmetic whitening in Indianapolis! Teeth whitening done in a professional Indianapolis dental office is a safe, effective way to brighten your smile. It's also perhaps the most economical cosmetic dental procedure. Depending on the whitening method you choose, results can be dramatic: in-office whitening, for example, can lighten teeth three to eight shades in a single hour. Professional whitening makes use of high-concentration gels that are not available over the counter. Ultimate: This packages gives you the benefit of having the treatment started in the safety and comfort of our office, with the convenience of being to also whiten on your own time at home! This powerful combination gives you the best results, hands down! Our team will perform an oral examination to ensure the discoloration is not caused by any issue in need of treatment other than whitening. Our professional staff will apply a powerful whitening gel to your teeth only, and allow it to whiten for 20 minutes, then rinse. After one more 20 minute application your teeth will be noticeable whiter! Our whitening gel is mixed only at the time of application, ensuring fresh results for every patient. We will then create custom whitening trays for your use at home. Having trays created specifically for you prevents the whitening gel from hitting areas of your mouth that could cause sensitivity or pain. With these trays, you can whiten on your own time, in the comfort of your own home. You select which flavor and stregth you prefer to use at home. In-Office: This technique offers the fastest results with the most powerful whitening solutions available. First, your gums and tooth-root surfaces will be covered with a protective barrier to ensure your safety. A thin plastic device known as a retractor will hold your lips and cheeks away from your teeth as a professional-strength hydrogen peroxide gel is applied. The gel will be left on for about 20 minutes, removed, and then re-applied. When this process is finished, the results will be obvious immediately. 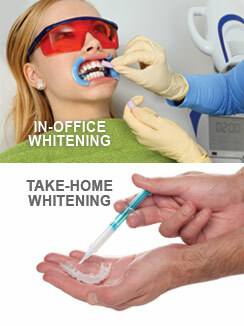 Gives you the safety and comfort of whiten with our professional staff, in our office. You are able to read or enjoy items from our comfort menu while we whiten your teeth. Take Home: This is another effective way to whiten your teeth, though you will play a greater role in ensuring the best possible results and several weeks may be needed to achieve your desired level of whiteness. First, a mold of your teeth will be taken and then two thin, flexible plastic mouth trays will be custom-made for you — one for the top teeth and one for the bottom. You will fill the trays with whitening gel and then position the trays over your teeth. The trays are left in usually for about an hour at a time. Custom trays prevent pain and/or sensitivity, which is caused by the solution hitting surfaces other than the enamel of teeth. 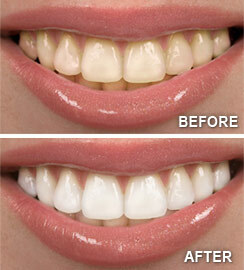 Allows you to whiten your smile in the privacy and comfort of your own home. Different flavors and strengths to choose from. Brighten For Life: This program is unique to our dental office in Indianapolis, as an afforable option to help maintain your whitened smile! We create custom trays, in order to make whitening as easy and comfortable for you! You will initially receive 4 tubes of whitening gel. Different strengths and flavors to choose from. At each 6 month preventive appointment, you will receive a free tube of whitening gel: free, as long as you maintain your 6 month preventive appointments. This program is meant to maintain a white smile, not as a first course of treatment. The Brighten for Life program is available for $167.